This most triumphant piece of clothing lets you fall with style. The wearer of the Pants of Parachute may, while falling, pull a ripcord and release a parachute from its secure storage in the buttocks area. Upon pulling the ripcord, the parachute releases and slows the wearer’s descent to 60 feet per round. When they land, the wearer takes no damage from falling. Once deployed, the wearer must spend five minutes stuffing the parachute back into the nondimensional pouch located at the buttocks before the Pants of Parachute may be used again. The Pants of Parachute hold the weight of the wearer, any gear they held before falling, and an extra 200 pounds. Any additional weight will cause the pants to rip. If ripped, the pants still slow the fall one final time, however all those clinging to the pants take 1d4 bludgeoning damage per 20 feet fallen and every creature nearby can see the undercarriage of the wearer as they hang limply in the air. Upon landing, the pants are destroyed. 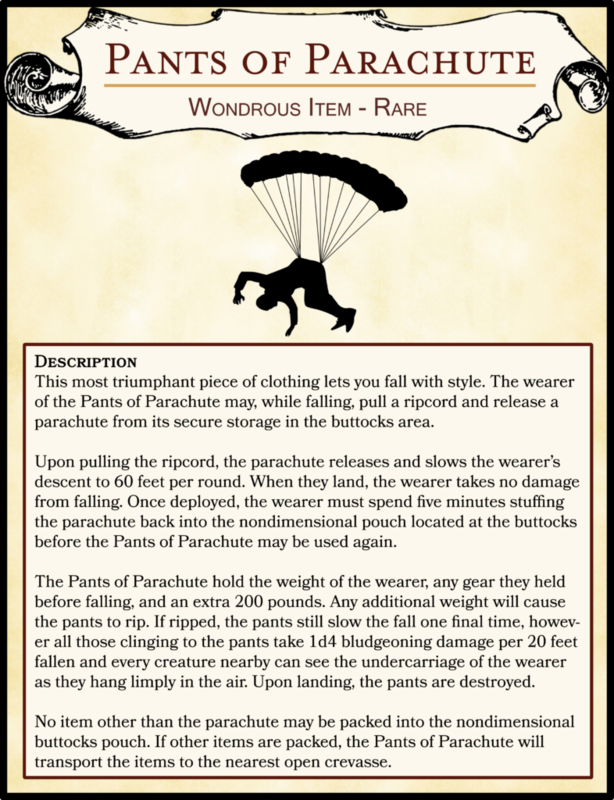 No item other than the parachute may be packed into the nondimensional buttocks pouch. If other items are packed, the Pants of Parachute will transport the items to the nearest open crevasse.